Food insecurity is a fundamental challenge to human welfare and economic growth in Africa. Low agricultural production leads to low incomes, poor nutrition, vulnerability to risk and threat and lack of empowerment. Land degradation and soil fertility depletion are considered the major threats to food security and natural resource conservation in sub-Saharan Africa. Investments in technology, policy and institutional reforms are needed to increase agricultural productivity, to ensure food security and sustained national economies. This book offers a comprehensive synthesis of agricultural research and development experiences from sub-Saharan Africa. The text highlights practical lessons from the sub-Saharan Africa region. Africa must break the cycle between poverty and land degradation by employing strategies that empower farmers economically and by promoting sustainable agricultural intensification using efficient, effective and affordable technologies. In addition, farmers and local entrepreneurs need to be linked to markets to increase their capacities to invest in sustainable land management. All these requirements need to be achieved through an integrated soil fertility management approach that is holistic and dynamic. Preface. Part I: Setting the scene/Introductory papers.A critical analysis of challenges and opportunities for soil fertility restoration in Sudano-Sahelian West Afric. E. Schlecht et alAppropriate available technologies to replenish soil fertility in southern Afric. P.L. Mafongoy. 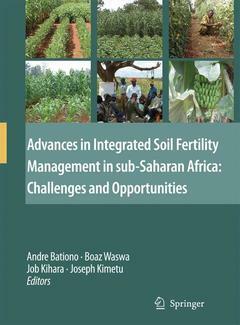 A. BationoAppropriate available technologies to replenish soil fertility in eastern and central Afric. J.R. Okalebo et alIntegrated Agricultural Research for Development: contributing to the Comprehensive Africa Agricultural Development Programme (IAR4D in CAADP. R. von KaufmannFrom Thousands to Millions: Accelerating Agricultural Intensification and Economic Growth in Sub-Saharan Afric. A. Maatman et alSoil scienc. population growth and food production: some historical development. A.E. HarteminkDevelopment of an arable layer: A key concept for better management of infertile tropical savanna soil. E. AmÃ©zquita et alFood Security in Africa: The Challenges of Researchers in the 21st Centur. J.B. KunguBackgroun. Current status and the African Context of the International Nitrogen Initiativ. M. Bekunda et alPart II: Integrated Nutrient Management (INM)Within-Farm Soil Fertility Gradients Affect Response Of Maize To Fertilizer Application In Western Keny. B. Vanlauwe et alCharacterisation of soil degradation under intensive rice production in Office du Niger zone of Mal. M. Bagayoko et alSoil fertility issues in the Blue Nile Valle. Ethiopi. P.I. VÃ¥jeOvercoming phosphorus deficiency in soils of Eastern Africa: recent advances and challenge. G. NziguhebaRelative contribution of trees and crops to soil carbon content in a parkland system in Burkina Faso using variations in natural 13C abundanc. J. Bayala et alMineral fertilizer. organic amendments and crop rotation managements for soil fertility maintenance in the Guinean zone of Burkina Faso (West Africa. B.V. Bado et alEffect of planting technique and amendment type on pearl millet yiel. nutrient uptak. and water use on degraded land in Nige. D. Fatondji et alShort-term effects of cover crops on stem borers and maize yield in the humid forest of southern Cameroo. A. Chabi-Olaye et alImproving cereal productivity and farmers income using a strategic application of fertilizers in West Afric. R. Tabo et alAdvances in improving Agricultural Profitability and Overcoming Land Degradation in Savanna and Hillside Agroecosystems of Tropical Americ. M. Ayarza et alIntegrating legumes to improve N cycling on smallholder farms in sub-humid Zimbabwe: Resource qualit. biophysical and environmental limitation. R. Chikowo et alMeat and bone meal as nitrogen and phosphorus fertilizer to cereals and rye gras. A.S. Jeng et alScreening Legume Green Manure for Climatic Adaptability and Farmer Acceptance in the Semi-Arid Agro-ecological Zone of Ugand. J.B. Tumuhairwe et alNutrient flows in smallholder production systems in the humid forest zone of southern Cameroo. J. Kanmegne et alManagement of improved fallows for soil fertility enhancement in the western highlands of Cameroo. F. Meppe et alIntegrated Soil Fertility Management: Use of NUTMON to Quantify Nutrient Flows in Farming Systems in Central Keny. A.N. Kathuku et alOptimizing Soil Fertility Gradients in the Enset (Ensete ventricosum) Systems of the Ethiopian Highlands: Trade-offs and Local Innovation. T. Amed. E. TabogeConsequences of Field Management and Soil Erosion on the Sustainability of Large Scale Coffee Farming in Kiamb. P.F. Okoth et alThe Use of Erosion Proxies for the Spatial Assessment of Erosion in a Watershed and Modelling the Erosion Risk in a GI. P.F. Okoth et alBean Improvement for Low Soil Fertility Adaptation in Eastern and Central Afric.